The Liberian Rainy Season is well on its way and with the torrential rains, comes the majority of agricultural activities. The local weekly markets flood with rainy season crops such as pepper, eggplant, sweet potato, and cucumber, as well as other products gathered from the forest such as palm oil nuts and giant snails. While the influx of fresh vegetables is excellent for seasonal community nutrition, there is little infrastructure in place to prevent post-harvest spoilage, and the glut of produce on the market drives down the price of vegetables by as much as four fifths of the dry season price. The low economic return on rainy season vegetables is particularly hard on rural women farmers who are responsible for the majority of vegetable production in Liberia. The Liberian Ministry of Agriculture, as well as other organizations focused on extension recognize the problems associated with extreme crop seasonality and are working on various initiatives aimed at smoothing out vegetable production over the course of the seasonal calendar. Those initiatives include efforts to reduce post-harvest spoilage through improved market access and infrastructure, and to improve community level post-harvest processing and food drying systems. Other extension initiatives are focused on promoting the production of vegetable crops during the dry season when market prices are high, nutritional intake is low, and communities have the most to benefit from eating and selling vegetable produce. However, despite on-going initiatives, the anecdotal evidence suggests that communities have been slow to adopt the dry season practices encouraged by extension agents. Unfortunately, there is little research data available in Liberia that addresses the gap between extended best-practices and community adoption, and even less that identifies specific gender-based barriers to adoption. Over the past few weeks I have collaborated with the Department of Regional Development, Research, and Extension (DRDRE), and the Department of Gender at the Ministry of Agriculture (MOA), as well as the Cuttington University College (CU) of Agriculture to develop a research proposal aimed at identifying gaps between extension and adoption for small holder farmers, with a particular focus on possible gender-based biases. If finalized and funded, the project will not only yield much needed community level data that the MOA can use to inform its extension strategies, but will also help build the standing of Cuttington University as a research institution and provide much needed research experience to the next generation of Liberian social scientists. As the woman farmer is instrumental to the future success of sustainable agriculture in Liberia, it is imperative for extension services to incorporate gender considerations and in so doing, constraints can be lifted and the contributions of these women can be fully recognized. 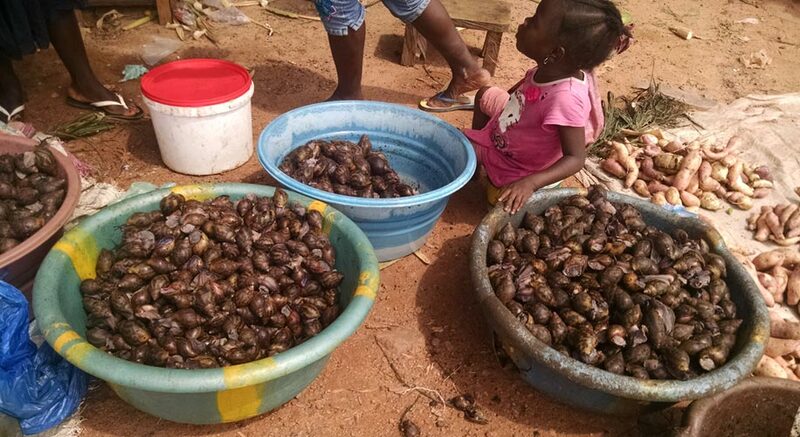 (Photo) Similar to French escargot, snails are a popular rainy season delicacy in Liberia and important supplementary source of animal protein. They are commonly sautéed in an onion, peanut, tomato sauce and served over rice.